Back in 1910 the highest paid singer in the world was blazing trails into the future. 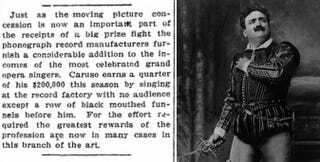 Italian opera singer Enrico Caruso reportedly pulled in a quarter of his $200,000 income (about $4.8 million adjusted for inflation) from singing to an audience of nobody. Which is to say, he was singing for recordings that would be listened to later. The May 22, 1910 Nebraska State Journal reported on this peculiar notion of singers performing without a crowd. The article notes recent changes to the music industry, as performers derived an increasing amount of revenue from recorded sound. "Caruso earns a quarter of his $200,000 this season by singing at the record factory with no audience except a row of black mouthed funnels before him," the article explained of our terrifyingly robotic future. Singing for nobody but black-mouthed funnels? What a time to be alive. "For the effort required the greatest rewards of the profession are now in many cases in this branch of the art," they went on, noting that it's a lot easier on the artist to just record a performance once and distribute copies than to play for a limited number of people live night after night. Indeed Caruso would become a prolific recording artist during the first two decades of the 20th century, recording over 200 songs and excerpts of operas during his lifetime. And at over $1 million a season from recordings alone (again, adjusted for inflation), it certainly paid off.